So you fancy your self a cheese connoisseur, or perhaps you know someone who lives, breathes, dreams cheese. (This hostess sure does). 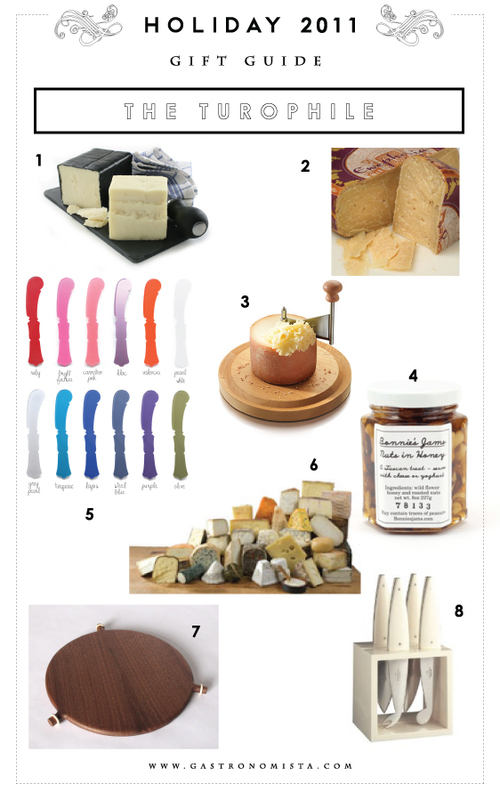 We've got some delicious cheeses and cheese related paraphernalia perfect for holiday fetes, stocking stuffers, and some seriously festive snacking. 1. Award wining Tournevent Chevre Noir Aged Cheddar, aged over 12 months is a smooth butter cheese that couples well with jams, nuts, port, or beer. And it has that handsome black wax coating, after all, anything high-contrast gets our attention. 2. Our favorite cheese as of late, Ewephoria. We almost fell over in the market after tasting this sweet, creamy, mind-blowing, 9 month aged, sheep's milk Gouda. Be warned, you might want to spend all future paychecks on whole wheels of this beauty. 3. Sick of grating cheese? So are we. We love this beech wood Cheese Curler - a perfect way to get those gossamer thin slices of cheese that melt on your mouth! 4. Nuts in Honey. Need we say more? 5. We adore these colorful spreaders - a great way to add some extra pizzazz to jam & brie spreading. 6. Not enough cheese for you? Well we've got the answer: Murray's Cheese of the Month Club. A different cheese delivered to your door every month! Genius we say. 7. We hate how our cutting boards always scoot along the table just as we're getting into some technical rind removal. Pat Kim has our dilemma solved with this 3 nub cheese board in walnut with silicon o-rings that prevent slipping and sadness. 8. Some cheeses deserve special cutlery. Not your average knife will do. Step up your Turophile's game with this gorgeous Consigli Buffalo horn handle cheese knife set. A set of four - one 3 inch blade for your semi-soft cheeses, one longer blade for your extra soft cheeses, and two knives for your Parmesan or other hard cheeses (read, Ewephoria). Apologies for the technical difficulties. We've updated our post with some delicious Buffalo Horn handle cheese knives by Consigli. We hope you enjoy!